The Beatrice Wilson Common Room will soon enjoy a new, much larger kitchen! 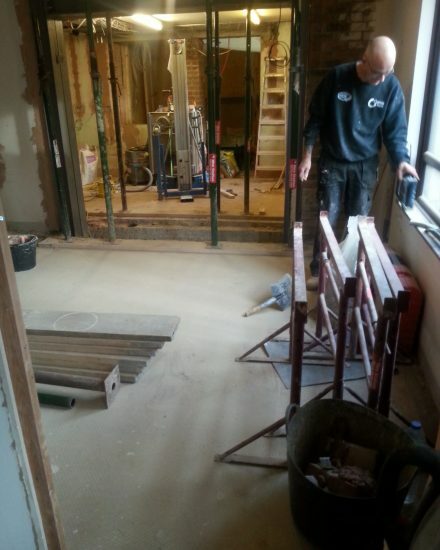 The picture from today shows that work is very much underway and in two weeks, it is hoped that the kitchen extension and refurbishment will be finished. We will share pictures with you as work progresses over this time. The Beatrice Wilson is the largest block of apartments owned by Rockdale and it was built in 1985. The iconic curved building is named after our founder and consists of three levels served by staircases and lifts and also houses Beatrice Wilson Common Room. This is where you will find so many activities going on during the week as well as our subsidised lunch service providing hot meals 5 days a week. Please click here for more information.